Some games require a ton of storage, like Warhammer 40K, and having a magnetic miniature case doesn’t make sense. Yet, there’s some smaller skirmish games, like Shadespire, where a magnetic miniature case is perfect. Regardless of the game you play, I’ve collected a list of magnetic miniature cases for those in the market. It’s not a big list I’m afraid. It doesn’t seem this type of case has really caught on (which surprises me), but it’s what I could find, so here you go! I feel it’s also worth noting that none of these cases are inexpensive. I’ve got a great article on the best affordable cases if that’s what you want because these aren’t it. I guess you can look at these cases as a serious upgrade. 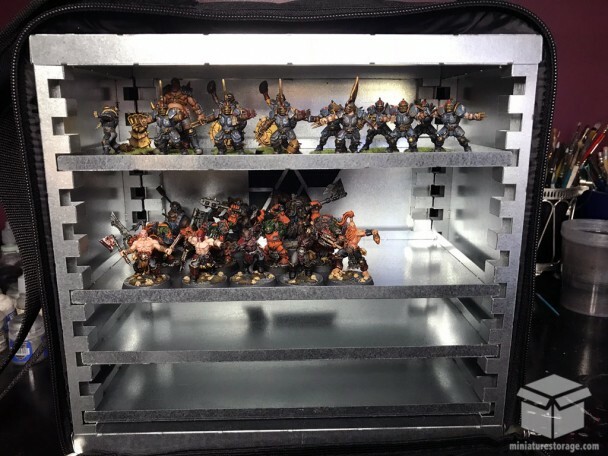 If you’ve invested a lot of time, money, and effort into your army, or your miniatures in general, then a case like those below are a great way to show off your stuff. They do also make it easier to set up your models, as well as pick them up, so they do have an advantage over traditional foam other than cool factor. 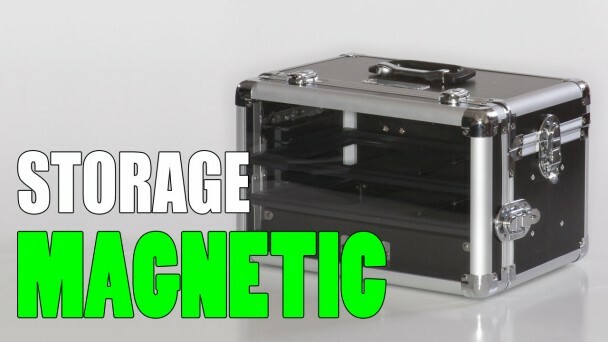 Another factor with magnetic cases is the space efficiency. While they are often smaller than the foam counter-parts, the storage you get is surprising. By standing up the models, instead of laying them down in foam, you gain a lot more room for your miniatures. Also, ultimately you save money with a magnetic case. You don’t have to keep buying new trays as your collection grows, you just buy some more magnets. So, while a magnetic case can be more expensive up front, you’re not spending that money on foam trays constantly, so you’re actually saving money. Also, it’s worth mentioning the obvious, even though the cases may be magnetized, your models aren’t unless you add magnets to their bases. So, besides shopping for a case, you also need to shop for magnets. The store I buy all mine at, and I highly recommend them, is K&J Magnetics. They’re located in the US, have awesome prices, and are very quick to ship orders. I’ve been using them since around 2008 and have never been disappointed. 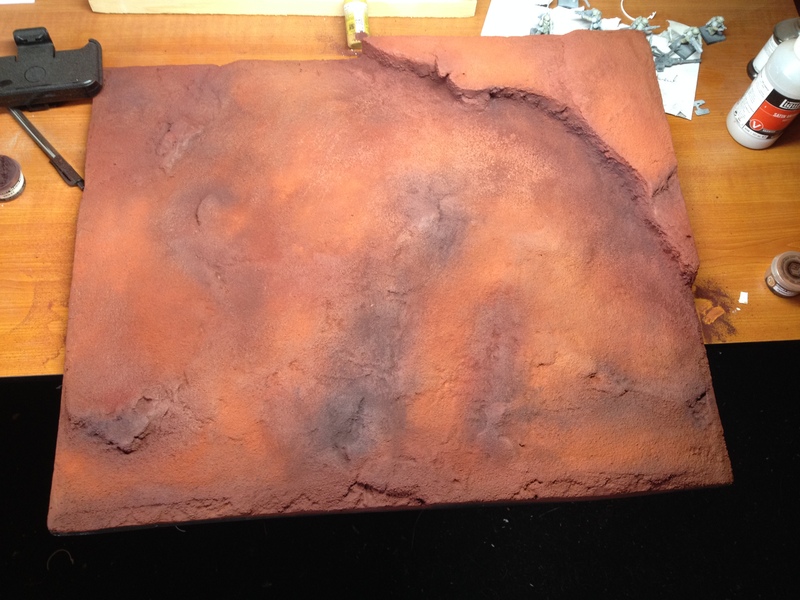 Specifically, the 1/4″ x 1/16″ magnets are perfect for the bases from Games Workshop. They are the perfect thickness and have a good magnetic pull without being too strong. The list is in alphabetical order to ease of browsing through. 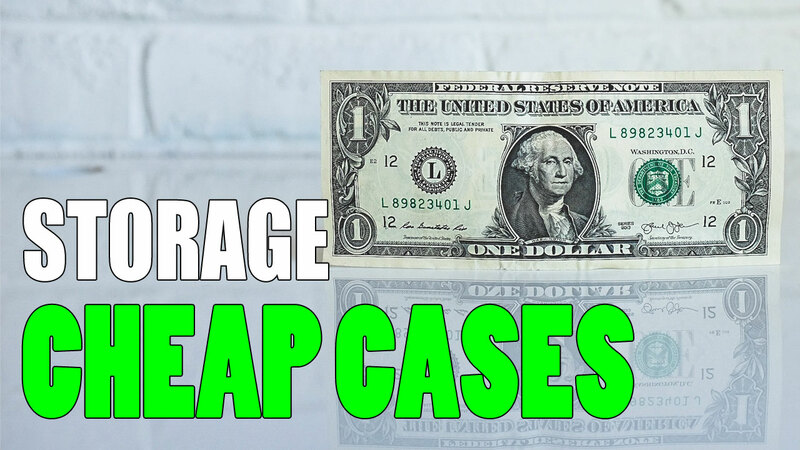 A-Case got its start as a indiegogo campaign that got funded. At that time it was known as Feldmaster, but they changed it to A-Case later after securing funding. The magnetic miniature case is made of a steel sheet metal which is magnetic. There is also an option to get an A-Case without the magnetic layer and instead get a sticky layer. The sticky layer is great if you don’t want to magnetize all your models, and they claim it holds just as well. Regardless of the model layer, the case comes with a cloth bag to put it in, which secures the frame. The bag has two pockets to store stuff, and a cool velcro strip on the top if you want to add badges and stuff, which is a neat option. So, if you’re interested in snagging a magnetic miniature case, and they do have a few options available (small to large), check out their website for details. 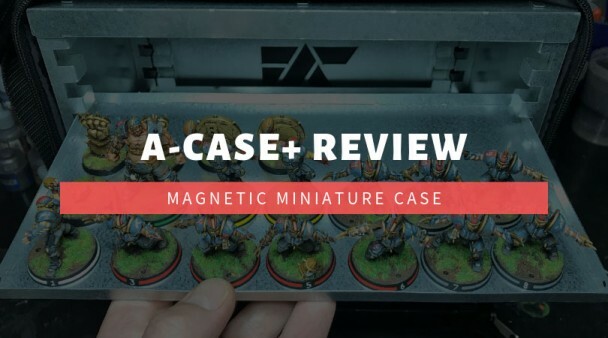 Also, I’ve got a thorough review of the A-Case+ if that’s a case you’re interested in. The A-Case+ is the smallest case they offer, and also the most affordable. Battle Foam has it all, including magnetic storage solutions. Magna Racks is what Battle Foam calls its magnetic storage. These are magnetic racks that fit into existing Battle Foam bags. So, you don’t need to buy a special bag for this. If you already have a Battle Foam case then you can get a Magna Rack to fit inside it, which is awesome. The price on the Magna Racks is really reasonable considering what you’re getting too. You can even buy individual components to create your own Magna Rack, or to expand on one you already have. Also, here’s a video from Battle Foam showing off the Magna Rack system. I would have to say that Battle Foam’s solution is probably the cleanest, most economical one in the list. Crystal Fortress cases are very cool to look at. They’re made of a high quality acrylic and you can combine cases to create a seemless configuration to meet you needs. Yep, the cases are completely modular. The other cool thing is that you create the configuration you need between picking layers, and the fact the cases are modular. So, you can always have exactly what you need, and you can easily change it on the fly as well. You can also get the cases without the magnetic layers as well. The models would then sit down into the case a bit, to keep from moving around, and you can use it as a display case, or still a transport case if you’re very careful. I think it’s a great idea that Crystal Fortress has going and I look forward to seeing what else they put out. Oh, also, this makes for a good display case as well. If you’re in the market, I have more miniatures display cases worth looking at as well. 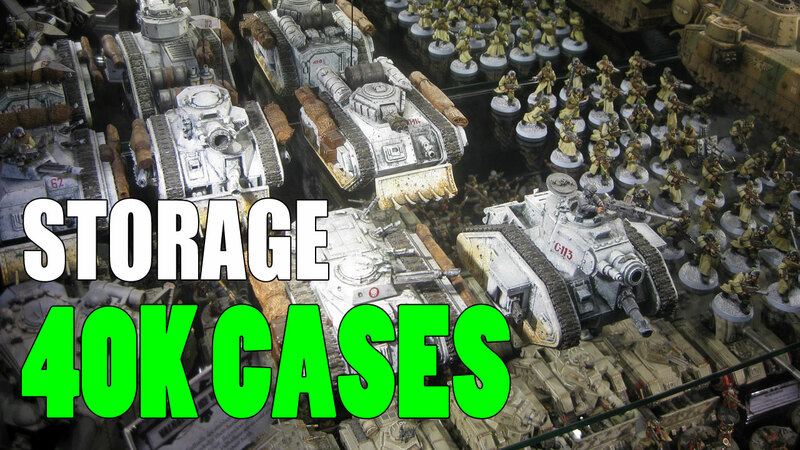 Tablewar cases are serious, heavy-duty cases. These things look like toolboxes but for your models, all while still retaining a cool aesthetic. 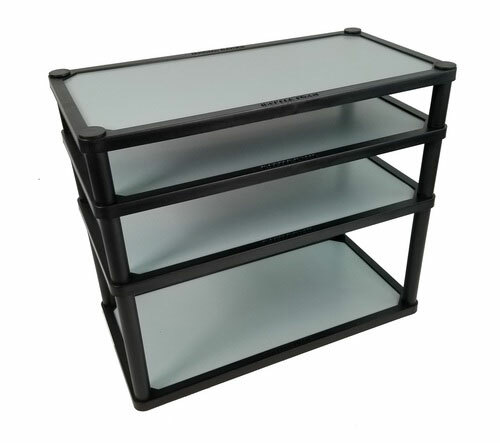 There’s a few case options with Tablewar, but they’re all heavy-duty, have a clear acrylic face, and a tray system to allow for customization. The trays that come with the case are not magnetic, however, you can buy magnetic trays separately to add into their cases. That’s not to say you couldn’t magnetize the trays that come with the Tablewar case if you wanted. These cases are the most expensive of the ones I’ve shown, but they’re very durable, so they do seem worth the cost if you can afford it. They are seriously impressive looking and the ones I’d get if I had the money. Now, you can definitely make your own magnetic setup for your models too. Basically, all you need is a magnetic surface, like sheet metal. You just need to get some magnets on your models, which you have to do for any of these, and then build your tray. Over on my hobby blog, an author of mine did a great article showing the magnetic display board he built. It shows you just how creative you can get while still having a magnetized board for your army. Here’s the finished product of the homemade magnetized display board. Like I said, a short list of magnetic miniature cases, but hopefully you’ve found something that interests you. Also, if you know of any other magnetic case options then please let me know in the comments. I’d love to grow this list. I totally forgot about the Magna Racks. Thanks for the reminder! Doh! You’re right. I should have said sheet metal. I’ll update that and thanks for catching it. In your “make your own magnetic board” section you say “Basically, all you need is a magnetic surface, like aluminum.” No! Aluminum is NOT magnetic! Sigh… So misleading…. Rest of the article is great though. You’re right. That’s me being an idiot. I thought I had already fixed that but I guess not. Thanks for pointing it out and I’m glad you enjoyed the rest of the article.